One final note is the capacity for a redundant powersupply. While I have never had the need for one, or even dual powersupplies (yet) the functionality is built into the case. I suppose if this case were being used for anything other then a server case that extra room could go towards a dedicated PSU for a peltier setup or possible a liquid cooling rig - but that's not for everyone. I love this case. That said it really doesn't provide more then basic usefulness with IDE. SCSI is the only way to go. As a home system this computer is just too big to suit most people's space considerations, but if you are a serious over clocker looking for self-contained cooling solutions (TEC, liquid, or refridgerant-based) this case would easily provide the space necessary for components, extra power, and holding tanks. As a server this case would easily qualify for small to mid sized applications, and clearly provides for more then adequate cooling. Air flow has been well thought out, with most exhaust fans at the top of the case to catch the hot air, instead of leaving it to pool, and raise case temp. 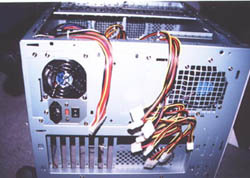 With intake fans located directly in front of hard drives, and cards, the hottest components are not forgotten. Users haven't been forgotten for the most part either, cracking open the case is easy, and access to individual components is optimal. The little features like drive activity lights are handy, last but not least the wheels make moving the case around ultra convenient. About the only two gripes I have are minimal, one the case is really poorly suited for more then the most basic of IDE configurations, two the reset button is only accessible via a tool, and secret lock on the front of the cabinet is a bit difficult to operate. Finally the cable pass throughs should be enlarged for easier access. This is a great little server case, and actually the only case I have ever had which I could use to hold the monitor, mouse and keyboard on. The mobility is a definite plus, and the cooling well thought out! The best source we've found for this case is Mediaware Direct Ltd in Canada which sells the Chenbro A9891 Net Server Case (w/o PSU) - model:CS-CH-NET-A9891 - for $290.00 CDN.